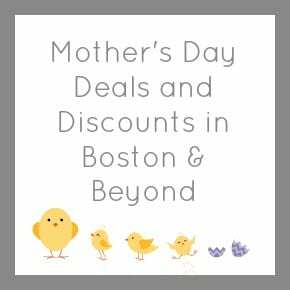 Mother’s Day is this Sunday, May 7, 2016 and I’ve rounded up fun and inexpensive things to do with mom– especially because she gets in FREE to a lot of places on Sunday! Sturbridge Village: Free admission for Mom on Mother’s Day! LEGOLAND Discovery Center: Free admission for Mom with a paid child’s admission on Mother’s Day! Franklin Park Zoo: Free admission for Mom all day long! Stone Zoo: Free admission for Mom all day long! Southwick Zoo: Half price admission for Moms this weekend! Roger Williams Zoo (RI): Free admission for Mom with a paid child’s admission this weekend! Davis Farmland: Bring your mom for free on Mother’s Day! If I missed any great Mother’s Day offers or freebies, please feel free to leave them in the comments and I will try to add them! Thanks! Hope you have a wonderful Mother’s Day and Happy Mother’s Day to all those awesome moms out there!